One Small Step is a Volunteering Matters befriending project that runs in the Stockton area, aimed at beneficiaries over 50 who may have lost their confidence and become isolated due to problems they have experienced; these may include illness, disability, bereavement, long term unemployment, divorce or little contact with their families. The project regularly sees everyone in the community working together – with staff, volunteers, and beneficiaries coming together to organise and partake in all sorts of events from lunches to art activities. Over the past few months the project has had no shortage of updates, and we thought there would be no better time to share them with you than to round up 2017! One of our beneficiaries, Denise, loves being involved in particular with the art activities. 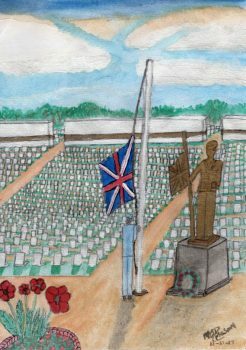 This November for Remembrance Sunday, she brought this drawing to show the group, which was inspired by how ‘The Last Post’ came to be written and the story behind the song. You can read more about what inspired her piece of art here! Back in August, the project teamed up with Preston Park Museum for another art project, to make these beautiful mosaic birds. Led by local artist Bub Bacon, the volunteers and befriendees created these lovely mosaics, which are now on display in the bird hides around the museum park. The park is often visited by schools and members of the public, and the mosaics can be used to help identify different species. ‘The Happy Talk Stroke Group’ volunteers help people who have had a stroke with their speech, by spending time chatting to them, playing simple word games and encouraging them to talk. Lyndsay and Claire (pictured here) are friends who volunteer together at the group. Lyndsay started first with the group in 2016 and she told staff that she has a personality disorder which means she lacks confidence and finds it hard to start things. Claire was under the community Mental Health Team and became friends with Lyndsey whilst they were both on the same hospital ward. She also has a personality disorder which severely affects her confidence and was finding it impossible to find things to do. Through Lyndsay, Claire was introduced to the group, and she has currently been attending for a few months. She says she loved it from the beginning, and couldn’t believe how friendly and welcoming everyone was. One Small Step has a long-standing relationship with the veterans group at the LiveWell Dementia Hub in Thornby, where volunteers help out with running the meetings and befrienders and befriendees attend together on a regular basis. 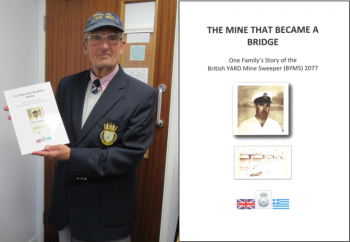 Earlier in 2017, one of our volunteers wrote a book called ‘The Mine that Became a Bridge.’ Ian (pictured) is an active member of the Veterans group at the Dementia Hub. His father served in WW2 and was lost at sea in Greece whilst carrying out his duties as a British YARD Mine Sweeper. The team at the Dementia Hub assisted with the editing and printing of the books, and they were donated to schools and libraries across the Stockton-On-Tees Borough, as well as being displayed in museums across the country. One Small Step also had the chance to collaborate on a project to make a mosaic to be installed in the Dementia Hub as a memorial piece for the veterans that attended the hub. Helped out by local community artist Bub (whose name you may recognise from the museum mosaic project!) the veterans worked out cutting the glass tiles, and practiced by making poppy mosaics for Remembrance Day, before setting to work on the final piece. Having fought in WW2, and being from different regiments and forces, the veterans happily spent time winding each other up whilst preparing their poppies! 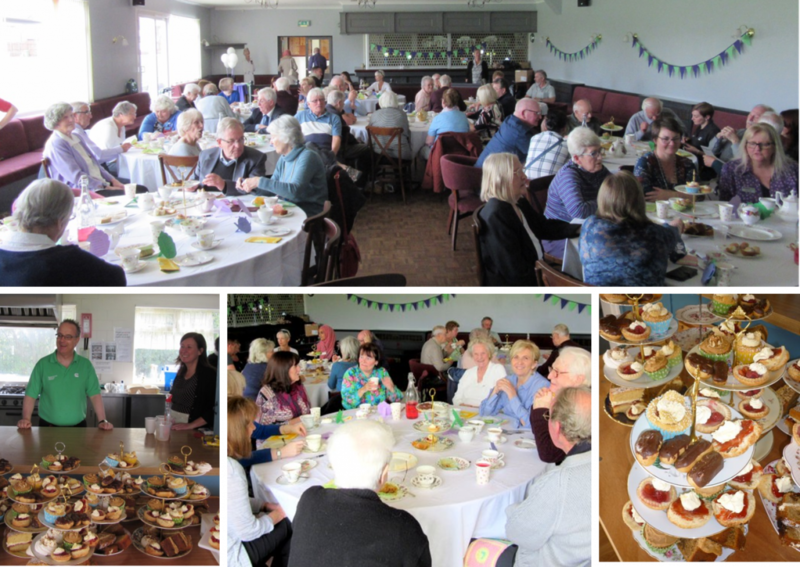 In October, One Small Step volunteers laid out a beautiful vintage afternoon tea, along with the help of local staff from Cummins Business Solutions who came along to help serve tea and coffee. They had entertainment, singing, a missing word quiz, and of course tea and cakes. And finally in the beautiful setting of the music room at Preston Hall Museum, the project had a sing-a-long to old Christmassy favourites like ‘Rudolph the Red Nosed Reindeer’, ‘White Christmas’, and ‘Frosty the Snowman’, with the help of the Green Dragon Ukuleles. It was a lovely opportunity for the befriendees and befrienders to go out together to a social event, and was once again helped by volunteers from Cummins Business Solutions. The event even had an extra twist to it as they had a magician, who entertained everyone with his amazing card tricks and sleight of hand. If you are based in the Stockton area, or know someone who may be interested in becoming a befriender or would like to take part in the activities, get in touch with Julia on Julia.Pennock@volunteeringmatters.org.uk. From One Small Step, have a wonderful December and a great festive period!